Frustration is the worst emotion you can have–if you want to perform well. When frustrated, you might feel upset or annoyed over making mistakes, poor calls by officials, or making turnovers–with the thought that you lack the ability to change your situation or achieve your objectives. Once you become frustrated, your game-time performance diminishes rapidly and, very often, are unable to get back in the right frame of mind to perform well. Jose P. is the lead scorer and top player on his youth travel team. Jose has tremendous ball skills and scores at least one goal per game. The team relies heavily on Jose as the offense is run primarily through him. One mid-season game, Jose had his worst game and was visibly frustrated through the majority of the game. The opposing team double-teamed Jose from the starting whistle and was very physically aggressive when Jose touched the ball. On several occasions, Jose looked exacerbated and questioned referees for no-calls. As the game progressed, Jose appeared to give less effort, waited for the ball to come to him, made several errant passes and committed two fouls out of frustration. 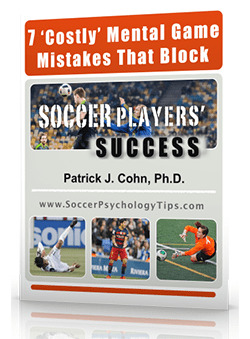 Even soccer players at the highest levels can succumb to frustration. Christian Pulisic, 18, is the youngest U.S. player to start a World Cup qualifier and is the future of the USMNT. Pulisic has scored 7 goals in 17 appearances for the USMNT. In a fifth round World Cup Qualifier match against Costa Rica, Pulisic grew increasingly frustrated due to being double-teamed seemingly every time he touched the ball and experiencing a few aggressive tackles. When Pulisic did get touches, he failed to make much of his opportunities. USMNT head coach Bruce Arena made note of how frustration affected Pulisic’s game. USMNT captain Michael Bradley believes the key to prevent frustration from taking over your game is to stay focused, composed and relaxed no matter what the tactics of your opponents. Your opponents will always seek to neutralize your strengths. If you allow the opposing team to upset you, you’ll be giving them an edge during the game. Conversely, if you can remain unfazed and stay composed, your opponent’s game tactics will backfire and, most likely, cause them to become frustrated. Immerse yourself in your performance rather than what your opponents are doing. Don’t waste your mental energy stressing about opponents. Be patient and don’t try to force passes or shots. You can’t get a mistake back. It’s in the past. Move on to the next play. Change your reaction to opponents to change you emotion. Stay composed and unfazed by what your opponents are doing. At least, put on your poker face to not show your frustration. 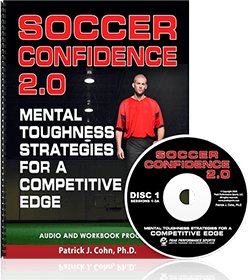 Learn all my mental game strategies for greater composure with Soccer Confidence audio and workbook program.